“Content is king” is a moniker that is repeated ad nauseam in the search engine optimization (SEO) community, particularly with the ultra-white hat crowd. It is, however, a deeply flawed statement. Content that is even the greatest out there is nothing if it exists in a vacuum. People and search engines have to not only be able to find it but to realize the value it inherently holds. And search engines especially can only determine value using proxy measures that signal that the content is good. If the signals that the content is king are not there, then it does not matter if it is king, queen, or something else. While content is certainly part of the SEO success story, it is far from the only piece or the ultimate piece. One key thing to do is prioritize your pages. Each priority page should have at least 3-5 high-quality external links to it; low-quality links no longer do you any good. Tools like SEMrush can help you see your keyword rankings- optimize for the ones where you are already doing pretty well if it is an older site as that may be low-hanging fruit depending on the competitiveness of the keywords. Based on your success and trial and error, you can scale to really amplify this impact. The next important thing to consider is not just the quality of content, but how often it is updated. The publishing date matters. The more frequently that your website and the pages within it are updated, the better because Google and other search engines see this as growth and freshness, which can be important in help signaling the relevancy of content. It is clear from some recent algorithm updates that Google is increasingly valuing timeliness in displaying results. The prominence of Google News results, as well as recent tweets in topical news searches, is a key example of this preference. Now the one caveat to this is for content that is not likely to have any timely updates. For example, articles about history will often not have many new findings. In these cases, it is less of an issue, but just think of how your competition might be doing in regards to this as well as what users might expect and go with that to really guide you. Freshness has been empirically studied by SEO experts and there are some strong data to support its importance. Even Google has admitted to this on their blog during the caffeine update of 2011. Case studies do go in both directions, but most seem to suggest that there is a positive correlation between frequently updated pages or sites and better rankings. It is hypothesized that the way Google might handle this is that new pages get a freshness boost that wanes over time if the page has not been updated. This mechanism likely incorporates an adjustment for how much of the content is being updated as well so a change of one or two words is not likely to do you any good. Furthermore, content changes to key parts of the content are more important than any changes overall- this renders many automatic updating and randomizing content generators and plugins with content management systems like WordPress potentially unhelpful. Real, genuine updates are what search engines are looking for. The next important thing is to really manage your website from top bottom and to take control of the index. Every page matters. Make sure to take full advantage of Search Console through Google Webmasters. The technical side here is very important in helping to keep your website fully competitive. With Search Console, you can verify that Google can first of all access your pages. You can also instruct Google on what to crawl and what is not important in that regard. Finally, you can check on the overall health of your site by looking at Google’s warnings and messages for you. Google has published a great guide to help you take full advantage of this wonderful free service. And now we come full circle. The final piece of the puzzle that we started off by discounting: good content. Yes, content matters. The point is that it is not the only piece of the puzzle and that it alone will not get you what you want. You need to have the other pieces discussed above. That being said, having quality content is always the backbone which will keep users on your site and come back. And as Google tries to improve its algorithms to better pick up on proxies for good content, the content itself will play a more impactful role moving forward. Not that this is not contradictory to anything said before this, but just that it is a more nuanced and realistic take on the old adage that content is king. So what constitutes good content? Well, first of all, make sure it sounds natural and offers information that users want. The content should be written with the end user in mind. Every single time. Furthermore, try to shy away from having too many pages with short content. 800-1000 words per page are the new standard by which you should shoot for. Also, make sure it really adds value even if that means linking out to relevant, but useful links. You may receive reciprocal links and even if you don’t Google will notice it as good content as long as you do not overdo it or send too much juice to your competitors. 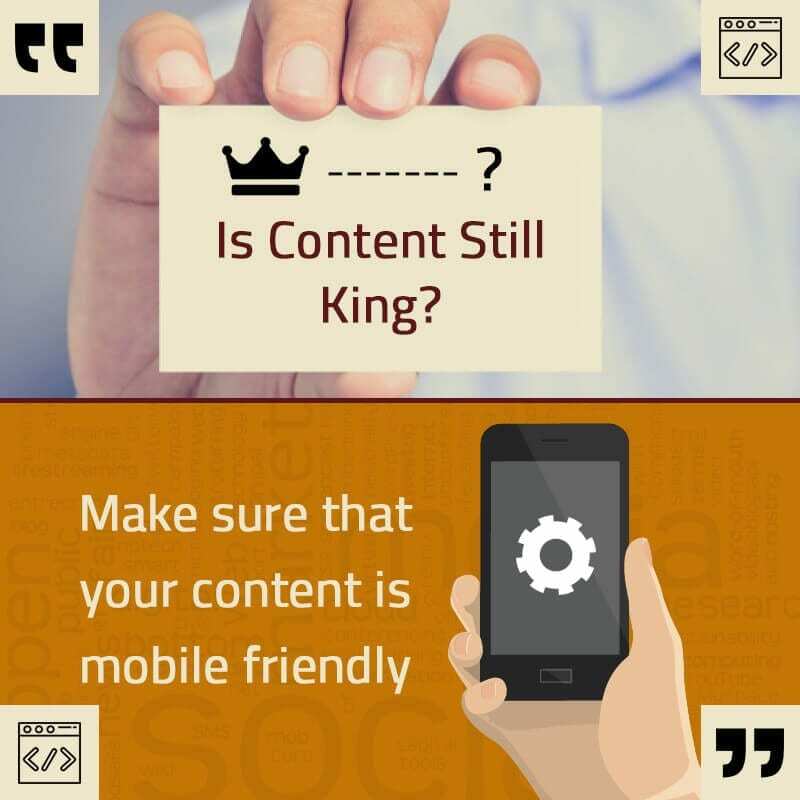 Finally, and certainly not least, make sure that your content is mobile friendly. A very high percentage of all internet loads are now on mobile devices and this is only projected to grow moving forward. Google penalizes websites which do not cater to these devices. Try to make sure you have a responsive design on your website for maximum versatility if possible. To conclude, a successful SEO strategy today is more than just about the content, even though it is a key piece. Promote, write, and create content for users and you will fare well.